Professor Horace Campbell to Deliver Distinguished Lecture Highlighting Urgency of a Canal System Renewal for Africa — UTech, Ja. 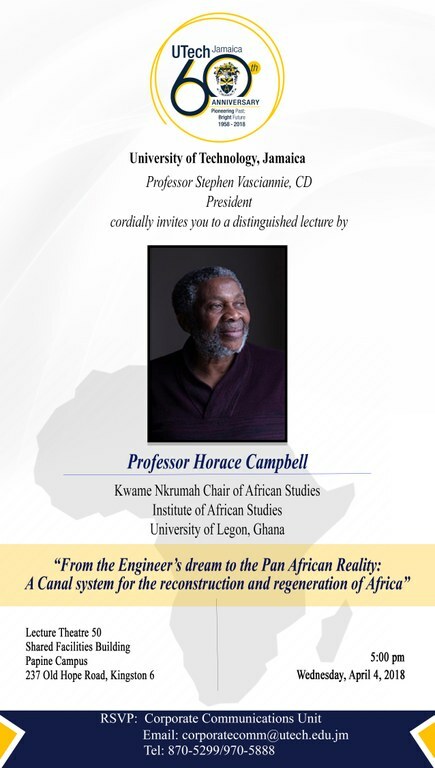 Jamaican-born, Professor Horace Campbell, Kwame Nkrumah Chair at the Institute of African Studies, University of Ghana, Western Africa will deliver the Distinguished UTech, Jamaica Public Lecture on the theme, “From the Engineer’s dream to the Pan African Reality: A Canal system for the reconstruction and regeneration of Africa’ on Wednesday, April 4, 2018. The public lecture is scheduled for 5:00 pm at Lecture Theatre 50, Shared Facilities Building, UTech, Jamaica Papine campus. The Distinguished Lecture is set within the context of Nigeria’s dying Lake Chad which has lost 95 per cent of its water over the past 50 years. Lake Chad has shrunk from over 25,000 square kilometres (sq. km.) to less than 2000 sq. km. This reality currently threatens the livelihood of 370 million citizens living in the countries of the Lake Chad Basin. The African Studies Professor will focus his lecture on proposed, innovative engineering solutions to address the full unification of Africa with an interbasin water transfer system to replenish Lake Chad. Professor Campbell will argue that this proposed robust canal system could draw on both surface water and the massive oceans of water in the aquifers. Professor Campbell asserts that “Caribbean engineers and environmentalists have an opportunity to be engaged in the global discussion to avoid the doomsday visions of the future of Africa,” and to be engaged as part of the knowledge pool of engineers and hydrologists all over the planet who will be essential to the Pan African project of renewal. The Distinguished Lecture is free of cost and is open to the public. Professor Horace G. Campbell is the Kwame Nkrumah Chair of African Studies at the Institute of African Studies, University of Legon, Ghana. At Syracuse University, he holds a joint Professorship in the Department of African American Studies and the Department of Political Science, Maxwell School in the United States. Professor Campbell has published widely. He has published more than 80 journal articles and a dozen monographs as well as chapters in edited books. his most recent book is Global NATO and the Catastrophic Failure in Libya: Lessons for Africa in the Forging of African Unity. He has also authored Barack Obama and 21st Century Politics: A Revolutionary Moment in the USA (Pluto Press, London 2010). Reclaiming Zimbabwe: The Exhaustion of the Patriarchal Model of Liberation (David Phillip, Cape Town, South Africa and Africa World Press, New Jersey, 2003), and Pan Africanism, Pan Africanists and African Liberation in the 21st Century (New Academia Publishers, 2006). His most well-known book, Rasta and Resistance: from Marcus Garvey to Walter Rodney (Africa World Press, Trenton, 1985) is going through its eighth printing, and has been translated into French, Spanish, Turkish and Italian. He co-edited the book, Tanzania and the IMF: The Dynamics of Liberalization (Westview Press, 1991), with Howard Stein. 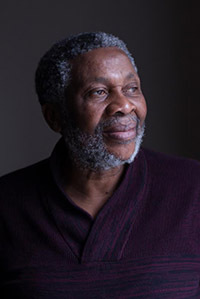 He is an activist for peace and for more than ten years served as a Board Member of the Syracuse Peace Council, the oldest peace organization in the USA. As a community worker he served for two terms as the President of the Pan African Community of Central New York (PACCNY). Campbell is an executive member of the North American delegation of the Pan African Congress and is active in the Global Pan African Movement. He also serves as the Chairperson of the Walter Rodney Memorial Committee. He is currently editing a book along with Patricia Rodney on the struggles for justice for Walter Rodney, focusing on the findings of the Commission of Inquiry into the murder of Walter Rodney on June 13, 1980. He is a member of the African Studies Association (USA) and the National Conference of Black Political Scientists. Professor Campbell completed his Bachelor’s Degree at York University in Toronto, his Master’s Degree in Political Science at Makerere University in Uganda, and his Ph.D. at Sussex University in England. He completed the research for his doctoral dissertation in East Africa.